The air was heavy with moisture and the pastures were replete with evidence of the overnight activities of our resident spiders. I grabbed the camera and raced the rising sun and drying conditions. 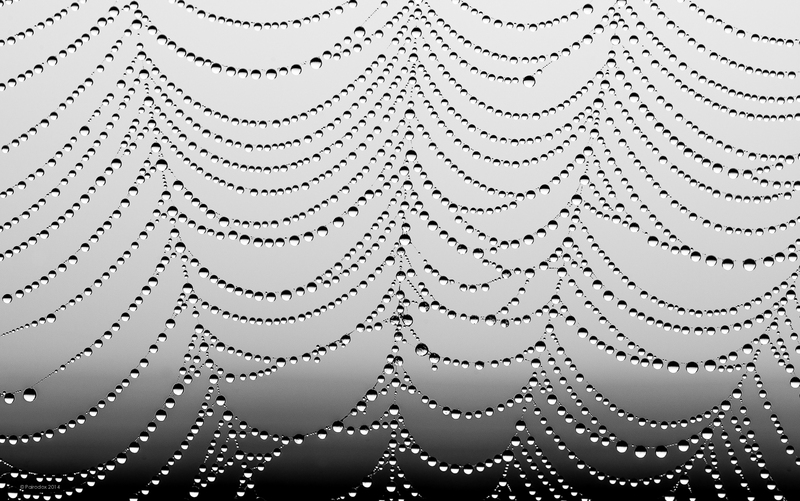 In a post that’s nearly two years old I presented a similar image of a spider’s web and wrote about the formation of dew. I said … it has only been quite recently that scientists in Beijing in have begun to understand why dew forms so readily on spider’s silk when, for example, it will not form on a human hair. It seems that spider’s silk is not as smooth as it would appear and knots of nanofibrils are situated along its fibers. Moisture condenses around these knots and collects as droplets which sparkle brightly in the morning sun. I wonder, does it spoil the beauty of a glistening dew drop to know why it forms and how dew can transform an obliging spider’s web into a beautiful string of pearls? No, I do not think so. I believe that when we come to understand some of nature’s mystery this can only add to its beauty. Oftentimes I find myself thinking about nature and trying to imagine why we, as animals, perceive the beauty of nature as we do. Not the physical why, with answers which concern electromagnetic radiation, the retina, and signal transduction to the brain but rather, that other why; the why which explains our ability to cognate nature’s beauty. For, in what way can the ability to perceive beauty be seen as adaptive, in a Darwinian sense no less? A complex question which deserves an equally complex answer to be sure. To develop a reasonable working hypothesis let us recognize that, in large part, we live our lives in pursuit of certain needs and desires. Food, shelter, reproduction, and pleasure are examples of these. We also know that our nervous systems are wired to respond to color, shape, symmetry, and texture such that we are capable of experiencing pleasure from certain modalities of these visual inputs. Such pleasures may be similar to those experienced by eating to satiation, being warm when it is cold, or dry when it is wet. Does not our ability to cognate beauty as pleasurable make us more amenable? More agreeable? And, generally nicer to be around? As social creatures then perhaps it is here that the significance of our ability to perceive beauty may be found?